Sunday School/Bible Class: 10 a.m.
Trinity Lutheran Church : "Christ is Our Cornerstone!" 1 Peter 2:4-7. Trinity Congregation was served as a mission station from 1872 to 1874. From 1874 to 1892, a graduate of the St. Louis Seminary was assigned as pastor. During this time, services were held in members' homes. In 1891, a school building was purchased, remodeled, and dedicated as the congregation's first church home; and on January 3, 1892 , Trinity Lutheran Church was officially organized. 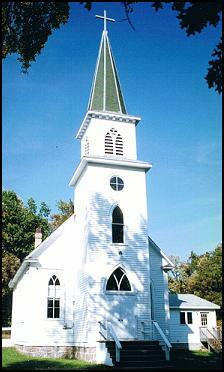 In 1968, Trinity joined the Lutheran Church-Missouri Synod. Worship services are held at 9 a.m. each Sunday with the Lord's Supper served the last Sunday of each month. Sunday School and Adult Bible Class meet from September through May following services. Trinity holds an annual block party in June, which is a local mission project to reach out to its neighbors. The present church building was erected in 1908. Trinity's present building will be 100 years old in 2008. A fellowship hall was added and dedicated in October 1994 and has brought the church into the 21st century with running water, a kitchenette, and an indoor bathroom, allowing members and guests to relax over a cup of coffee and chocolate treat after worship and during Bible studies. Most of all, the additions have allowed for fellowship and Bible studies. Trinity will not become over-programmed. It will continue to explore ways of reaching out to the community without compromising the closeness and warmth of a country church.